Looking for a venue to host an event? You've come to the right Plaza! Quinceañeras, wedding receptions, wedding ceremonies, graduation parties, birthdays, funeral receptions, concerts, album & film release parties: we've hosted them all! We're ready for your event too. Give us a call! 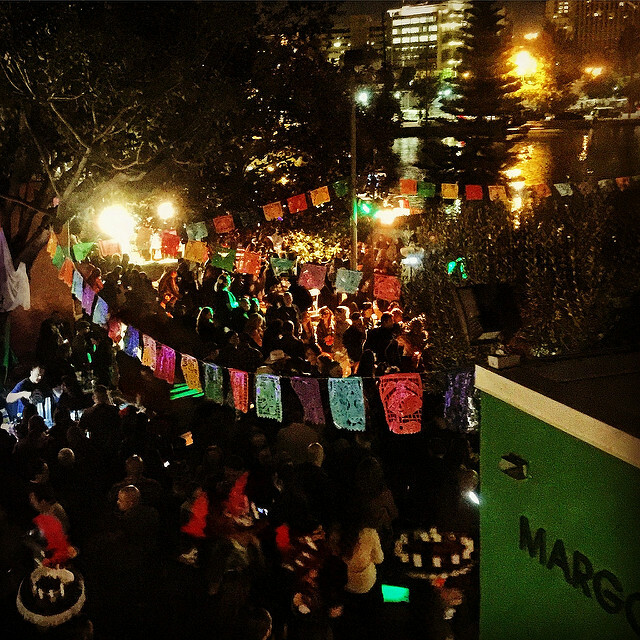 Below, find two things you should know about hosting an event at Plaza de la Raza. For the last few years, we've held several events both big and small at Plaza de la Raza. From close-knit family parties hosting as few as 50 people, to big music festivals featuring 5,000 attendees and a 20-band lineup. Plaza has it all: a gorgeous lakeside view, a decorative fountain, full kitchen, two outdoor courtyards, a dance hall, a 40-space private parking lot, and a 200-seat auditorium. All you need to do is provide the guests, the decorations, and the good time. We assist in set-up and cleanup and can provide tables, chairs, and basic tablecloths. If you need any help, Plaza de la Raza is happy to recommend photographers, planners, and caterers who have worked with us before and have exceptional skills. Plaza de la Raza's event rentals fees depend on a variety of factors: the number of your guests, whether or not food will be served, the length of your event, and the time of the year. Because of this, we are unable to list any prices online. If you'd like to request a no obligation quote, give us a call at (323) 223-2475, or fill out the contact form below. So we can reach you! Please type: "Event Rental Request" in this box. Please tell us: what event you'll be hosting, your estimated attendance, whether food will be served, and your requested date/time, or top three dates/times.